José F.A. Oliver is a contemporary German-language author of Spanish descent. In 2013, he received the Stipendium der Kulturakademie Tarabya, spending four months as writer in residence in Istanbul and publishing 21 Gedichte aus Istanbul 4 Briefe & 10 Fotow:orte (2016), a collection of poetry, photography, and prose inspired by his experiences there. Encountering firsthand the turbulence of the Gezi Park protests and the political persecution of students, artists, intellectuals, and activists in the months that followed, Oliver’s memoirs from this time have striking resonance three years later in the wake of Turkey’s failed military coup. In cooperation with the author, the MGP is pleased to offer a rolling preview of English-language editions of these poignant texts, translated by MGP contributor Jon Cho-Polizzi. It’s often windy on the Bosporus, and this first letter dangles like a fishing lure. I do not yet know how much line I’ll need to cast accurately. With what arc, with what force? Perhaps I am the bait. The water bites incessantly into the land, gnawing memories back into the sea. The fate of this continent-striding, 18 million inhabitant metropolis was ever won upon its waves: The sea! Be it unwarlike, the most beautiful Turkish word is yakamoz: “The moon reflected on the water.” The young men who leap into the Bosporus tonight will one day tell their children of its beauty. But only they. I have, as yet, seen no women bathing here along its shores. I eat fish and bread. The tiny wooden stools become familiar. The mackerels: Made in Norway. At the quayside of Tarabya lies trampled a deceptively realistic carpet of artificial turf. The illusion all but perfect. Behind it, a concrete café. An ancient sheep dog dozes in the cooling shadow of a mulberry tree. A tangle of wildly matted fur. Tagged ear. Asleep. Unlike the city which never rests. The idle walker is inevitably reminded of the putrid street. Moth-eaten. Dog catchers abound. The hardline policemen are on the hunt, as well. Erratic swarms of yellowjackets. The air in Central Istanbul is heated, while Asia twinkles faint and peacefully matte across the waves. A tower of pearls, spirited away. Rolled out. The lights sparkle midnight blue, henna red, new copper. The quiet of the mosques warns in prophet green, even after the müezzinler fall silent. Sometimes their voices stumble on the air, and then their calls to prayer unfold like tangled cassette spools in the sky. A short time ago, I heard the words: “Take only half of every story and you will stand within the shadow of the truth.” It dawned on me: Istanbul is not simply one truth, but an atlas of human reality. The margins of a puncture wound. The scars of history. The Turkish navy have been crossing over the water road for several days now. More openly than usual. Thousands of Syrian refugees are already stranded here. The city has swallowed most: illicit work is cheaper. Istanbul sways with every moment of every age. A lesson in world events on the peripheries of Eurasia. The suppressed point to the prescribed silence. Disappearance paired with time-honored Ata Pride and a religious impress. Only gradually do I develop a sense for the chess rules of the country’s language. Of Turkish grammar. It seems as though one could string together words unendingly. Just as the city opens its maw, devouring the hinterlands. The homeless desperation of the slums; banking house minarets already burnished on the drawing boards. Affluence. Frigidity. Miniature Dubais for those servants of the stock exchange. Plate glass seraglio in Levant or Maslak. The contest of history where Byzantium once braved the Sea of Marmara, becoming Constantinople only to fade in turn. The Greeks and the Armenians are no more. Like so many others in this world congregation. I do not yet wish to speak of churches or of the synagogues. Only the Roma, coerced, resettled. They clamber through the districts and neighborhoods, carting loads of paper scraps like mules. Anatolia resounds throughout. On the İstiklâl Caddesi, the shopping mile, there are even Kurdish customs to observe. Yet this openness is only superficial prayer. Denied by the youth in the side streets and alleyways of Beyoğlu. And by their parents. Gazing westward. Not far from Gezi, nearby Taksim. Present. Just as the incessant tourist steamers drop their heavy anchors at the Golden Horn. A few hours of Orient. A dream bazaar. Most of these passengers know nothing of the god-fearing rituals in some neighborhoods of Fatih, or of the newest migrant language spilling over inevitably into these pious quarters. The gentle tongues of Russian women murmur for the oldest profession in these seaport towns. 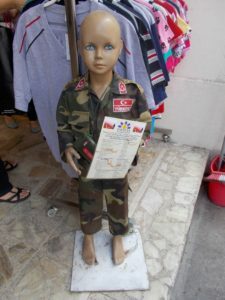 In Kadıköy, in Asia—köy means village and kadı means judicial office—there stands a child-sized window mannequin. Wearing the flecktarn camouflage of war, blue-eyed and silent, she whispers of the coming unrest. With crescent moon and star and epaulets. An early start. Some call this newly molting era post-democracy. Not in Istanbul alone. This entry was posted in Blog, Kunst und Sonstiges. Bookmark the permalink.